Is gun control the solution? Would stricter gun laws curb shootings like this? In my opinion, the short answer is no. I feel like Bill Murray in the movie “Ground Hog’s Day.” Murray is a journalist reporting on small-town America and keeps waking up stuck in the same day. Except instead of a rodent looking for his shadow on a superstitious holiday in February, there is another mass shooting in America at a school for adolescence. There are reported dead, injured and a young shooter with mental health issues. Marjory Stoneman Douglas High School in Parkland, Florida, now joins Sandy Hook, Columbine, Virginia Tech and many others on a growing list of infamous schools. Republicans are sending up thoughts and prayers; Democrats are calling for stricter gun control; and once again, social media feeds reflect the ignorant divide of the nation’s political parties. 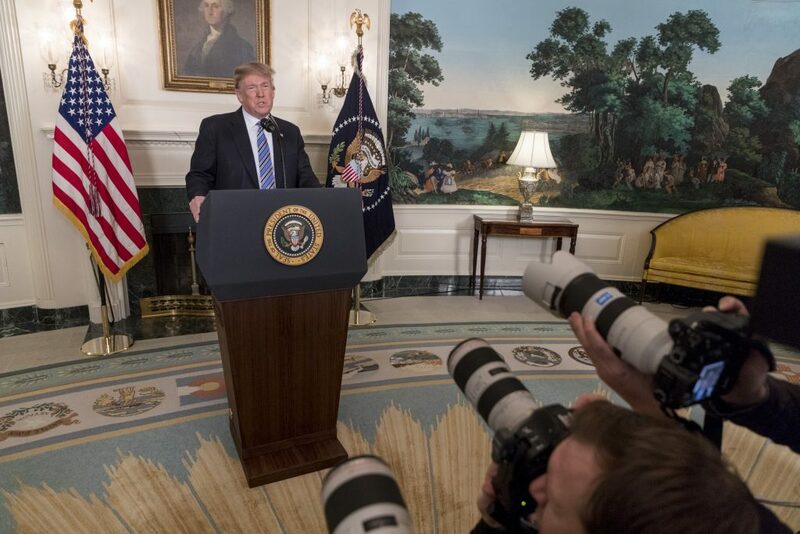 President Donald J. Trump addresses the nation following the recent mass shooting in Florida. This shooting occurred weeks after a gunman terrorized a Kentucky school. Two students were killed in Kentucky and 14 injured. In Florida the tragedy is worse, 17 students and faculty have been slain and another 14 wounded. Many across the nation are trying to figure out why. Why is this a continuing problem in the U.S.? Others are reeling in shock and debating on even attending school. Parents are confused about sending their young to receive an education or protect them by means of isolation. A large social movement is gaining strength. Advocates want stricter access to firearms in order to prevent the next Parkland, Florida, which seems inevitable in the constant stream of news footage showcasing one school shooting after another. We as a culture are accepting this as a normalcy rather than setting differences aside to solve the real issues behind these events. It is clear through tone and statements from both sides that even media coverage seems to forget the victims and their families to raise a flag in support of or opposition to gun control. Florida law permits someone of 18-years or older to purchase AR-15s, a rifle styled after military type assault weapons. They are used for hunting, sport and collecting by gun enthusiasts. Nikolas Cruz, the 19-year-old shooter, used one to murder his peers. Is gun control the solution? Would stricter gun laws curb shootings like this? In my opinion, the short answer is no. Stricter gun laws would do nothing to stop a person like this from harming others. The problem is multifaceted, and therefore the solution must be too. However, an update for sensible gun law reform needs to happen; either pass federal law or regulate state law. The shooter in Florida bragged about planning this online, shown multiple warning signs of mental health issues and police were called to his home over a dozen times. How was he able to legally purchase this rifle at 18-years-old with these extenuating circumstances? I cannot justify any reason this kid was able to purchase this firearm legally without training or screening. More strenuous background checks could have prevented this. Raising the age limit to purchase a firearm could have. Mandating mental health checks and supervised training before approving the purchase of the rifle could. Many things could have prevented this, not just more gun control. Better education could have prevented this. Interpersonal communication could have prevented this. Recognizing the signs of mental illness and the reaching out of a deranged adolescence for attention could have prevented this. We as a nation need to recognize the multiple causes for mass shootings and treat the problems as a whole. A Band-Aid on a hemorrhaging artery will not stop the bleeding. In my opinion, that is what more gun control would be like. We need to have more interpersonal communication, as in face-to-face speaking with one another. We need to teach our young that every life is precious and stop focusing on emphasizing oneself over all others. We need a boatload of better education. When every person hunted for food, we as a culture had a deeper understanding and respect for firearms. We knew they could take life. We knew what the consequence for taking life was. We knew that all life was precious and there was an urge to protect thy neighbor as thy brother. We did not glorify cultures of violence and were taught there were other ways to solve problems. Children did not sit for hours playing video games that give rewards for killing the most people. Our movies were not inundated with celebrations of “heroes” that indiscriminately kill mass amounts of people in third-world countries. There are many things that need to be done in the U.S. to curb our mass shooting pandemic. Children across the nation are scared to go to school. A place that should be a vestige of security has turned into the adolescent terrorist playground. We must stop pointing the finger at guns and each other. We need to take a deep introspective look at our culture and recognize the causes as a whole. Until we do, we will continue to wake up to the same tragedy playing again and again.